It doesn’t matter whether you’re a B2C or B2B business, a charity or a large public sector organisation, social media should play a key role in your overall marketing strategy. Unfortunately, social media takes time, resources and specialist knowledge. Everyone can set themselves up a Facebook account and start posting. That part is easy! But not everyone can build a loyal customer fan base that interacts with your brand, and ultimately, converts your readers into customers. From Facebook to Twitter, Pinterest to Instagram, we manage our clients’ social media platforms, right from strategy, to posting and design. Social Media Strategy – What Do We Do? In order for us to create a social media strategy, we need to have a full understanding of your business – your target market, your current marketing, your goals etc. Our team will then get to work on putting a plan together. 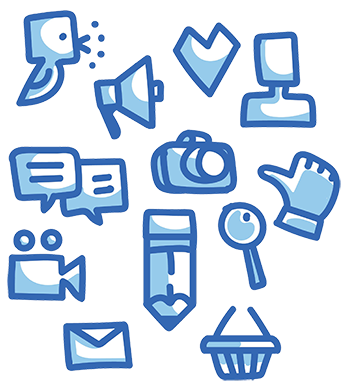 We can set you up your social media pages, designing you eye-catching covers and profile pictures, all the way to developing you a social media strategy while managing the posting for you on a daily basis. Contact us now and we can discuss how to make your social media work for you. Often, we’ve found that clients just need a helping hand with social media. We can set up your pages for you and deliver training to you and your team on how to best manage your social media. We’ll start as simple as you like, from how to post and attach a photo, to how to run a competition through an app or engage with a wider audience. The great thing about social media training is that we can tailor it completely to your business, but it’s more cost-effective than full on management. If you’re interested in social media training, contact us here.